C. F. Martin 1-C Model Concert Ukulele, c. 1940's, made in Nazareth, PA, natural lacquer finish, mahogany body and neck, rosewood fingerboard, original brown soft shell case. A very nice example of one of our most requested instruments: An older Martin Concert uke. 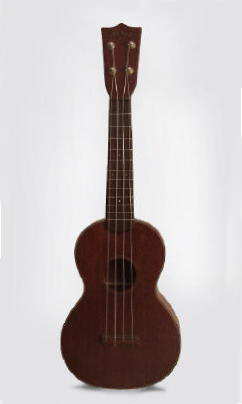 The concert size ukulele is somewhat bigger than the soprano but smaller and more "uke-like" in feel than the tenor; this larger body and longer neck give not only a deeper, richer tone but the fingerboard has a lot more room for advanced modern uke stylings. This Style 1-C dates to the late 1940's or early '50's and is in very fine playing condition, with a great sound. Overall length is 23 1/2 in. (59.7 cm. ), 7 3/4 in. (19.7 cm.) wide at lower bout, and 2 3/4 in. (7 cm.) in depth at side, taken at the end block. Scale length is 15 in. (381 mm.). Width of nut is 1 3/8 in. (35 mm.). One small repaired back crack and one similar top crack; some light finish wear-all original and pretty clean overall. On the back of the headstock, a previous owner's Dymo label application has left a ghost impression...hello "Wayne M. Rapozo" wherever you are! Includes the original chipboard case with plastic handle. Excellent Condition.